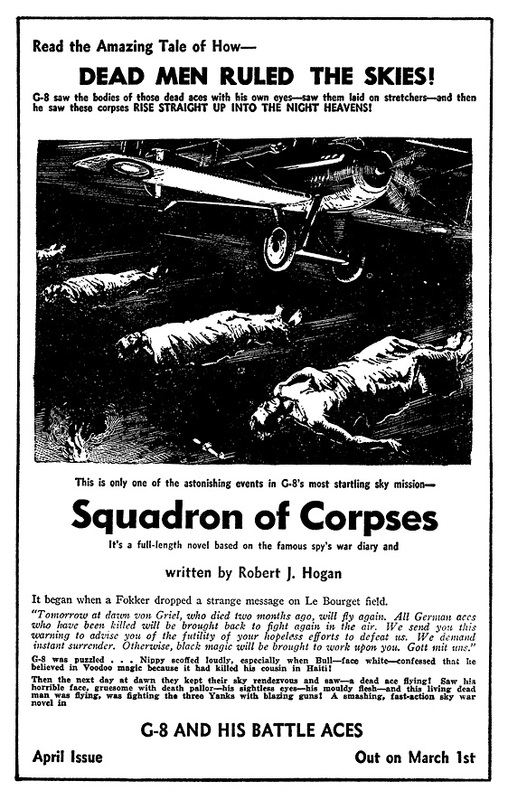 When the publishers of G-8 and His Battle Aces announced the formation of a G‑8 Club in the seventh issue (April 1934), G-8 promised that “this club is going to be different from any other magazine club in the country. It will be a secret organization.” So successful was the club that it persisted throughout the ten-year run of the magazine; So successful was the pledge of secrecy that NO evidence of its membership has turned up in the last 75 years. Until now. But even though individual members did not receive identifying papers from the magazine, local chapters of five or more kids did, in the form of a G-8 Club Charter. In order to form a chapter of the G-8 Club in your community all you needed to do was find four friends who also bought G-8 every month, and mail in five club coupons from the same issue. (Some chapters were formed by individuals in different communities connecting through the G-8 letters column.) 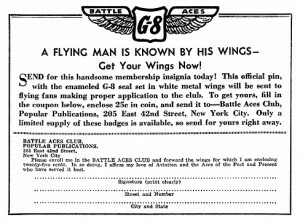 The June issue reported that the very first chapter of the G-8 Club mailed their coupons on February 28th — actually a day before the street date of the April issue that announced it. Qualifying clubs received a charter, a small (7″x5″) but distinguished-looking two-color certificate with a blank for the name of the chapter (ideally to be named after a local bird) and “signed” by G-8. 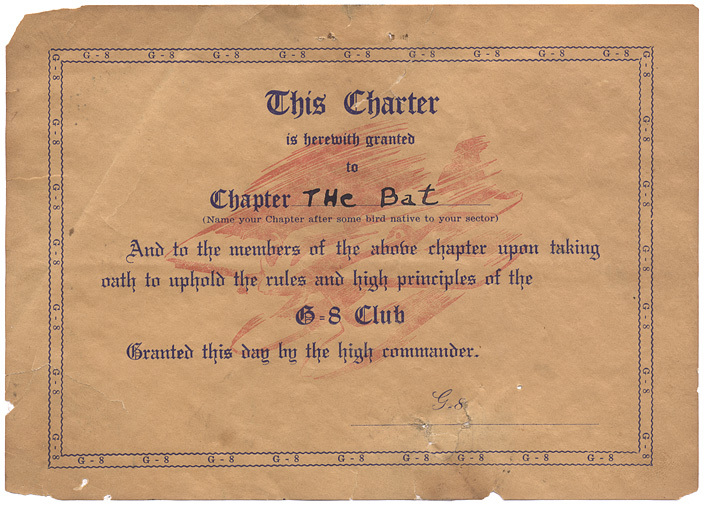 In addition they received the Rules and Secret Orders for the Operation of the G-8 Club Chapters a tri-fold brochure (5″x7″ folded) that consisted of one page detailing the meeting rules (including an oath) and two pages describing the club’s SECRET CODE, none of which was ever reprinted in the magazine. G-8 and His Battle Aces didn’t offer any other premiums for many years following the launch of the club. 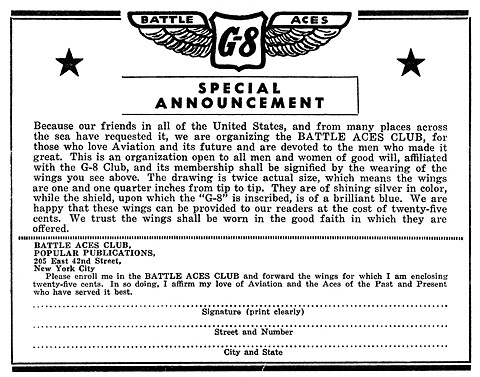 Then, in the November 1939 issue, came the “Special Announcement” of the G-8 Battle Aces Club Wings — silver metal wings with a blue enamelled shield in the center, measuring 1.25″ wide. As the announcement makes clear, this is not for the secretive G-8 Club (remember, that would blow your cover) but a separate, “affiliated” Battle Aces Club. Strangely, after this “Special Announcement” there was no mention of the badge again until the April 1941 issue, when the wings coupon became a staple of the club section of the magazine through October 1942. The wings offer reappeared for two months in the final year of G-8, with a interesting variation: golden wings. Only one example of the G-8 Wings has ever turned up and yet it sold at auction in 2007 for only $800. 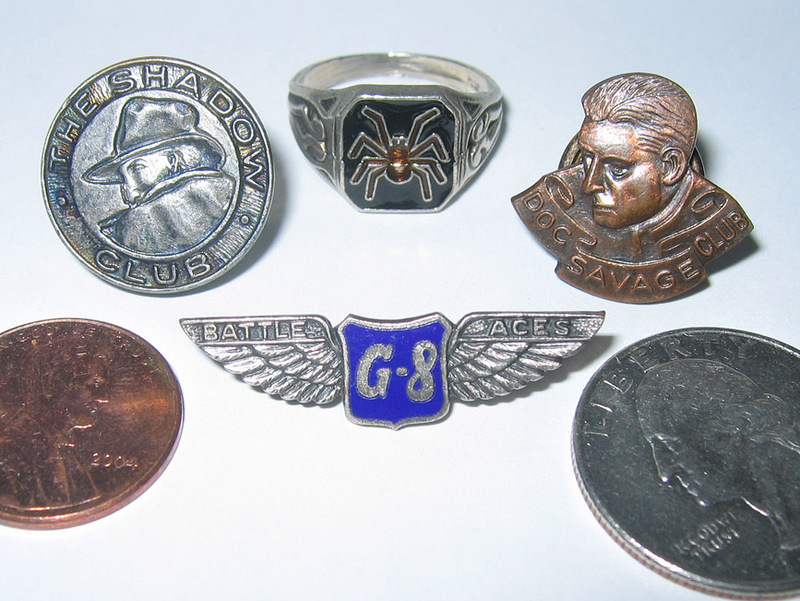 Like the Spider Ring, the G-8 wings were produced by Uncas Manufacturing Co. of Providence, Rhode Island, and bear the company stamp of a “U” with an arrow through it.